The focus of this study was to evaluate the long-term outcomes associated with endoscopic gallbladder stenting (EGBS). Cholecystectomy is a fundamental treatment for acute cholecystitis. However, some patients are considered that it is a high-risk because of their advanced age or underlying diseases. 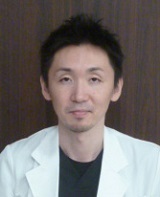 In high-risk surgical patients who do not undergo cholecystectomy, the recurrence rate of cholecystitis is very high. Recently, for high-risk surgical patients, EGBS has been attempted to prevent recurrence of cholecystitis. However, because the evidence regarding the long-term outcomes of EGBS is sparse, its efficacy for the prevention of recurrent cholecystitis is uncertain. We investigated the cholecystitis recurrence rate in high-risk surgical patients with acute calculous cholecystitis, and compared the cholecystitis recurrence rates in patients in whom long-term EGBS was performed with the rate in patients who were observed after percutaneous drainage. The result of this study determined that the cholecystitis recurrence rate is significantly lower in patients in whom long-term EGBS compared with that in patients who were observed after percutaneous drainage. However, stent-related adverse events including cholangitis and stent migration, occurred in patients who underwent EGBS. 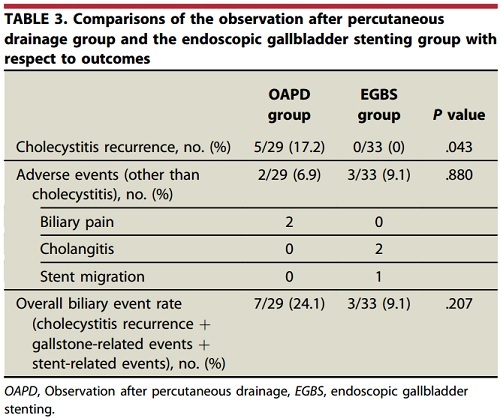 In overall biliary event rates, including cholecystitis recurrence as well as gallstone-related and stent-related adverse events, there were no significant differences between the patients who underwent long-term EGBS and those who observed after percutaneous drainage. To establish EGBS as a treatment for the prevention of recurrent cholecystitis in high-risk surgical patients, more efforts need to be made to decrease stent-related adverse events.